Sending virtual cards online is a better and faster way to wish happy holidays to your family and friends. 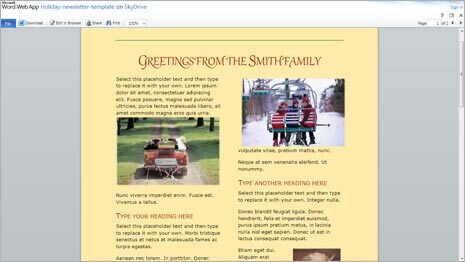 Using Microsoft Office program and loads of free cool looking templates – you can create custom holiday cards and newsletters in no time. Besides creating stuff for online sharing, you can print your holiday creations and then mail them physically for traditional wishing. Using Microsoft Word program, you can create customized holiday cards. You can either start from scratch or use already made holiday template for your card (or newsletter). 1. If you wish to create simple and effective Holiday newsletter, just download newsletter template (click download button next to File button at the top) [more templates] . Once you download the template file, open it in Microsoft Word program and start editing by adding new text and custom photos. 2. Once editing is complete, you can print the card for sending by mail box. You can also share your creation with online friends using Live Sky Drive feature. This will allow recipients to view your newsletters or cards online without need of Microsoft Office installed on the computer. 3. After saving your edited and customized card (or newsletter) file, click goto File > Save & Send option. Then click ‘Save to Web’ option and further click Sign in button. Once you login into Live Sky Drive account, upload your created newsletter or card online to Sky Drive account and share with any friend online. You can create new Sky Drive account for free (if not already created). 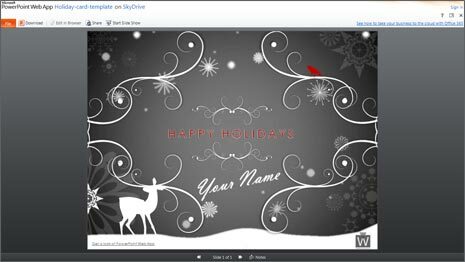 Just like cards and newsletters in Microsoft Word, you can generate animated Holiday cards using Microsoft PowerPoint program containing your custom text Holiday message and name. 1. To get started, download Holiday card template on your computer (or edit it online). 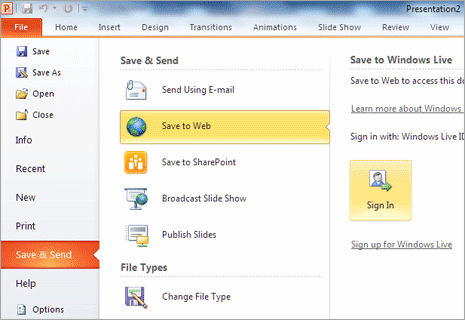 Open the downloaded template in Microsoft PowerPoint program and proceed with editing. Besides the glitz, you can also keep functional check on expenses during Holiday season using custom Holiday Budget template for Microsoft Excel program.